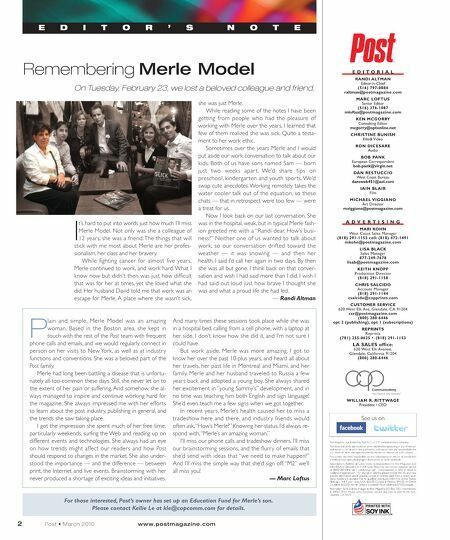 Remembering Merle Model On Tuesday, February 23, we lost a beloved colleague and friend. E D I T O R ' S N O T E 2 Post • March 2010 www.postmagazine.com A D V E R T I S I N G MARI KOHN West Coast Sales Manager (818) 291-1153 cell: (818) 472-1491 mkohn@postmagazine.com LISA BLACK Sales Manager 877-249-7678 lisab@postmagazine.com KEITH KNOPF Production Director (818) 291-1158 CHRIS SALCIDO Account Manager (818) 291-1144 csalcido@copprints.com CUSTOMER SERVICE 620 West Elk Ave, Glendale, CA 91204 csr@postmagazine.com (800) 280 6446 opt 2 (publishing), opt 1 (subscriptions) REPRINTS Reprints (781) 255-0625 • (818) 291-1153 LA SALES office: 620 West Elk Avenue, Glendale, California 91204 (800) 280-6446 Post Magazine is published by Post, LLC, a COP communications company. Post does not verify any claims or other information appearing in any of the ad- vertisements contained in the publication, and cannot take any responsibility for any losses or other damages incurred by readers in reliance on such content. Post cannot be held responsible for the safekeeping or return of unsolicited articles, manuscripts, photographs, illustrations or other materials. Subscriptions: Address all subscription correspondence to Post Magazine, 620 West Elk Ave, Glendale, CA 91204. Subscribers may also contact customer service at (800) 280 6446, opt 2 (publishing), opt 1 (subscriptions) or send an email to csr@postmagazine.com For change of address please include the old and new address information, and if possible, include an address label from a recent issue. Subscriptions are available free to qualified individuals within the United States. Non-qualified 1 year rates: USA $63.00. Canada & Mexico $94.00. All Other Countries $133.00. Airmail Delivery is available for an additional $75.00 annually. Postmaster: Send address changes to Post Magazine, P.O. Box 3551, Northbrook, IL 60065-3551. Please send customer ser vice inquiries to 620 W. Elk Ave., Glendale, CA 91204 E D I T O R I A L RANDI ALTMAN Editor-in-Chief (516) 797-0884 raltman@postmagazine.com MARC LOFTUS Senior Editor (516) 376-1087 mloftus@postmagazine.com KEN MCGORRY Consulting Editor mcgorry@optonline.net CHRISTINE BUNISH Film& Video RON DICESARE Audio BOB PANK European Correspondent bob.pank@virgin.net DAN RESTUCCIO West Coast Bureau dansweb451@aol.com IAIN BLAIR Film MICHAEL VIGGIANO Art Director mviggiano@postmagazine.com WILLIAM R. RITTWAGE President / CEO See us on I t's hard to put into words just how much I'll miss Merle Model. Not only was she a colleague of 12 years, she was a friend. The things that will stick with me most about Merle are her profes- sionalism, her class and her bravery. While fighting cancer for almost five years, Merle continued to work, and work hard. What I know now but didn't then was just how difficult that was for her at times, yet she loved what she did. Her husband David told me that work was an escape for Merle. A place where she wasn't sick, she was just Merle. While reading some of the notes I have been getting from people who had the pleasure of working with Merle over the years, I learned that few of them realized she was sick. Quite a testa- ment to her work ethic. Sometimes over the years Merle and I would put aside our work conversation to talk about our kids. Both of us have sons named Sam — born just two weeks apar t. We'd share tips on preschool, kindergar ten and youth spor ts. We'd swap cute anecdotes. Working remotely takes the water cooler talk out of the equation, so these chats — that in retrospect were too few — were a treat for us. Now I look back on our last conversation. She was in the hospital, weak, but in typical Merle fash- ion greeted me with a "Randi dear. How's busi- ness?" Neither one of us wanted to talk about work, so our conversation drifted toward the weather — it was snowing — and then her health. I said I'd call her again in two days. By then she was all but gone. I think back on that conver- sation and wish I had said more than I did. I wish I had said out loud just how brave I thought she was and what a proud life she had led. — Randi Altman P lain and simple, Merle Model was an amazing woman. Based in the Boston area, she kept in touch with the rest of the Post team with frequent phone calls and emails, and we would regularly connect in person on her visits to New York, as well as at industr y functions and conventions. She was a beloved part of the Post family. Merle had long been battling a disease that is unfortu- nately all-too-common these days. Still, she never let on to the extent of her pain or suffering. And somehow, she al- ways managed to inspire and continue working hard for the magazine. She always impressed me with her effor ts to learn about the post industry, publishing in general, and the trends she saw taking place. I got the impression she spent much of her free time, particularly weekends, surfing the Web and reading up on different events and technologies. She always had an eye on how trends might affect our readers and how Post should respond to changes in the market. She also under- stood the impor tance — and the difference — between print, the Internet and live events. Brainstorming with her never produced a shortage of exciting ideas and initiatives. And many times these sessions took place while she was in a hospital bed, calling from a cell phone, with a laptop at her side. I don't know how she did it, and I'm not sure I could have. But work aside, Merle was more amazing. I got to know her over the past 10-plus years, and heard all about her travels, her past life in Montreal and Miami, and her family. Merle and her husband traveled to Russia a few years back and adopted a young boy. She always shared her excitement in "young Sammy's" development, and in no time was teaching him both English and sign language! She'd even teach me a few signs when we got together. In recent years, Merle's health caused her to miss a tradeshow here and there, and industr y friends would often ask,"How's Merle?" Knowing her status, I'd always re- spond with, "Merle's an amazing woman." I'll miss our phone calls and tradeshow dinners. I'll miss our brainstorming sessions, and the flurr y of emails that she'd send with ideas that "we need to make happen!" And I'll miss the simple way that she'd sign off. "M2" we'll all miss you! — Marc Loftus For those interested, Post's owner has set up an Education Fund for Merle's son. 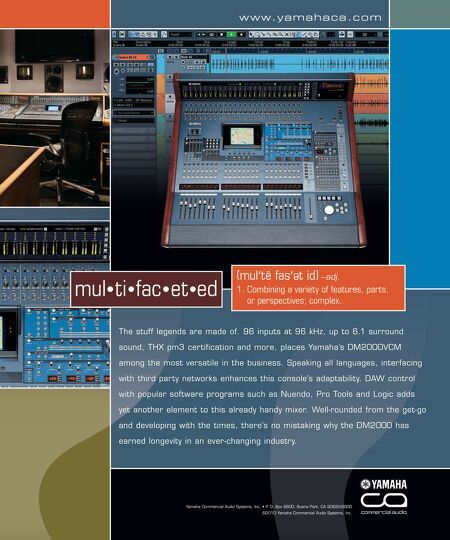 Please contact Kellie Le at kle@copcomm.com for details.